I’m always on the hunt for the best products to help keep people warm in the cold winter months. That’s why I was so excited to see these Outdoor Research Lucent heated gloves and write a review on them. They’re called the Lucent and you won’t be disappointed with them. If you’ve ever owned a product made by outdoor research then you’ll be well aware of the high quality that they produce. If you haven’t, then let me explain. They’re one of the top brands in outdoor gear and apparel and they have been for a long time now. One thing you can be sure of when you buy an OR product is the quality. They’re reputation is as good as anyone’s and better than most. I’ve owned quite a few of their products over the years and I’ve never been disappointed in any way. In fact, I think I still own every OR product that I’ve ever bought which is a testament to their quality. Heated gloves are the type of product that you really want to put a lot of value on quality which is why I highly recommend these Lucent Heated Gloves. When I saw that OR was making heated gloves I got really excited because I knew they’d instantly be producing top of the line gloves that consumers could count on. I’ve actually owned a pair of OR gloves for the last 10 years but the Lucent is the first pair of OR heated gloves that I’ve ever tried. I had really high expectations so I wasn’t about to go easy on them if they didn’t live up to their name. Fortunately they did live up to the expectations. As soon as I pulled them over my hands I could feel the comfort. They hugged the hands in such a soft and gentle way without being too bulky or pillowy. I think part of the reason they feel so nice on the hand is because of the fleece lining. The only small drawback in the comfort department is that they are a little stiff. They will losen up slightly after some use but they are a pretty stiff glove. Even after wearing them for hours they still felt great. They have a nice size gauntlet that fits over the sleeve nicely and you can barely even notice that there’s a battery pack in there. The GORE-TEX allows them breath so your hands won’t get clammy or sweaty when things warm up. They’re filled with synthetic EnduraLoft insulation which will keep your hands warm and even hold the electric heat in nicely, making them quite efficient. I found them to be one of the warmest gloves I’ve ever tried and they even have a mitt option which would somehow be even warmer. I’m giving them a 19/20 in the comfort category and a 20/20 in the warmth category. A really good start for these gloves. As I mentioned above, these gloves have GORE-TEX inserts which make them not only breathable but completely waterproof too. On top of the GORE-TEX inserts they are also made of a 100% nylon shell that will repel most of the moisture as well. The palms are made of water resistant goat leather which does really well in this department too. Although the palm will start to absorb some water after a while, none of the water will actually get through to your hand. In this categor I’m giving them a 19/20. Very close to getting a 20 but the palm did absorb a little moisture so I had to dock them one point since I don’t do half points. The Outdoor Research name is right up there with the best. I know that from experience and they’ve never let me down so that should give you some reassurance. Another thing I can tell you is that they’re very good about returns and warranty. They have what they call the Infinite Guarantee. This guarantee basically means that they will replace any product that doesn’t last. This is a really nice peace of mind to have when buying heated gloves and I think this alone justifies the cost of these gloves. Warranty asside I have to say that these are really well built gloves. The stitching is very tight and you can feel the durability in these gloves. The zipper for the battery pouch is very strong feeling and I’d be surprised if it ever malfunctioned. The back of the hands are made with a really strong nylon that seems durable enough for any recreational activity. With all of this being said, I still don’t recommend using these as work gloves. I think they’ll hold up really well for and recreational activity but they are designed to withstand sharp objects or heavy duty use of tools. I’ve yet to come across a pair of heated gloves that are better quality than these and that’s why I’m giving them a 20/20 in this category. I found that these gloves fit true to size. I usually wear a Large and these were no different. If you have any doubts about size just have a look at our Sizing Guide and that should clear it up for you. If you make a mistake and decide you want a different size, OR is really good about returns and they should happily exchange them for you without trouble. As you can tell, I love these gloves. I’ve reviewed a lot of gloves and these ones rank right at the top. I really wanted to find some flaws with these so that you could be well informed but I just couldn’t find much in terms of critism. I guess the only flaw would be that they aren’t compatable with touchscreens so you have to remove them to use your phone or camera. Not a huge deal but that is one little gimmick that I’ve grown to like when I’m recreating. For those of you who aren’t addicted to your phones, this shouldn’t be a problem for you. Your problems with cold hands will most deffinitely be solved should you choose to buy a pair of these. As I said before, the cost of these is easily justified. Please don’t be afraid to leave me questions or comments using the box below. I’m always happy to communicate with you and I’ll respond ASAP. Do battery Heated Gloves Work? I agree that the price is a little steep compared to what we’re used to with gloves. But you have to remember that regular gloves just aren’t good enough for a lot of scenarios and so what’s the point in paying less for gloves if they’re not going to be useful? I’d rather pay more and get a great pair. Plus Outdoor Research guarantees all of their products for life so you can imagine how awesome the quality is. It really is top of the line. I’m glad you liked my review and I’m happy to see that you’re excited about this product. I can understand your concern over the price of these. A lot of people would never think to spend that much on a pair of gloves but you have to remember that this is a whole new thing. These aren’t just regular gloves. They’ll guarantee that you’ll nevewr have cold hands again. That should be worth a lot and I can tell you that people who buy them are please with the value. Will give it a try in the future if it gets worst here. Hi Robert – who knew that there are heated gloves? That’s pretty darn cool. I’d always favored mittens over gloves, because mittens let all of my fingers (minus the thumb) benefit from each other’s body heat. When wearing traditional gloves, each finger is separated from the rest and my fingers tips always get cold. Do you find that the OR heated gloves heat each finger evenly? Yes this pair is great for evenly distributing the heat. The heat goes all around the palm and around each finger perfectly even. They are very comfortable. Where have you been all my life, these gloves are the solution to all my problems! I used to stay in the UK to work and man, I couldn’t stand the place when its cold. Its really affecting me at work as I can’t really focus when my hands can’t move. Unfortunately I’m in Malaysia now so I won’t be using them much though. Bookmarked your page for the next time i’m abroad, cheers! Thanks for the kind words, I really appreciate it. No I don’t imagine you would ever need heated gloves in Malaysia. One thing I should mention is that we do write about cooling clothing products as well so if it gets really hot there you might be interested in reading about some of that stuff. Here’s a link to the article. All of OR products come with what they call the ‘Infinite Guarantee’ which means that they have a lifetime warranty. If you have any issues with your gloves just fill out the warranty form found on the OR website and send your product back. How do you think these will do snowmobiling? I tend to get very cold digets do to pore circulation. These gloves would be perfect for snowmobiling. 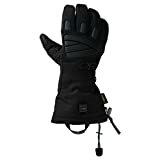 I’ve used them both for sledding and as motorcycle gloves and they work fantastic. I want to get a pair of heated gloves and these are one of 3 am currently looking at. The other two would be the iXS X-7 Lithium-Ion Heated Gloves and the Gerbing XR-7. I will using them for a daily commute in London-Journey times vary from 15-45mins. If you tried the other two gloves – your feedback/review would be appreciated? Also in terms of protection-abrasion resistant and armour am taking it the OR has minimal armour protection if any at all? So all of these gloves you mentioned are good quality. I think you will be happy with any of them. I have tried all three of these and the biggest difference is that the Lucent isn’t actually made for riding motorcycles and the other two are. The Lucent will keep you plenty warm but they won’t offer a lot of protection in case of a crash. So if protection is important to you then you would be better off going with one of the other two options. What would be your top pick for hunting? The ability to squeeze the trigger is important. So there shoud not be too much material between the index finger and the trigger. It allso works best if the marerial around the index finger is not too thick. Thanks for the kind words and for the question. I am actually in the process of writing an article showing the top gloves for hunting. There aren’t too many heated gloves on the market that are specific to hunting but there are a couple good options. My favorite so far is the Seirus Hunting gloves. These are really great actually. In addition to those there is also a nice pair of Flambeau Heated hunting gloves that are a little bit cheaper than the Seirus ones and still performed well. I am a serious walker here. I do 6 miles a day. I usually have one of my Labs with me but my fingers get cold in the traditional thinsulate type gloves. Do you think these gloves are made well enough to keep my fingertips warm and withstand holding a dog leash an hour and a half a day? I live in the Philly area and the problem I have is when it dips below 30. Further I may need to walk much earlier in the morning than I do now so the sun might not be up yet. Thanks. Look forward to a response. Thanks for the question. Yes I do think these Lucent gloves would withstand your daily god walks. They are really well made and durable. If you really are concern about durability though there is a pair of heated gloves that are made for working with hand tools which are extra durable. They are called Volt Heat Work Gloves and they can take a lot of abuse. I would recommend that but if you’re unsure you could always try a pair of heated liners that you just wear underneath your regular gloves. Liners would keep you nice and warm and then your regular gloves would protect them and keep them in good shape. Here’s an article I wrote on good heated glove liners. And thanks for the repply my question about the hunting gloves. Please consider having allso other than hunting gloves in your test for best hunting gloves. I think these might be good for hunting in addition for the seirus gloves that you mentioned: OR stormtracer heated goves. I think you’re right. There are some great heated gloves out there that aren’t made specifically for hunting but would still make great hunting gloves. Have a great day. Dealing with cold hands while skiing, especially cold fingers. Will these be effective into single digits ? Or is the Seirus Heat Touch Hellfire a better choice for skiing. Got to have warm hands !!!! These will be warm enough. If you’re really concerned about cold hands you could always go with a heated mitt instead. But if you’re not into mitts, these Lucent gloves will be more than warm enough. That being said, the Seirus Hellfire gloves are even warmer than the Lucent. Useless gloves. Bought based on this review. Heavy. Stiff. The heat from the batteries is not much help. Almost impossible to get spare batteries (especially outside USA). Get some mitts with wool. I’m really sorry to hear that and I’m also very surprised. These are one of my favorite pairs of heated gloves and I’ve never heard a negative thing about them until your message. Please contact OR and I’m sure they will refund your money without hesitation. Best of luck. I am a cyclist and really am unable to manage in temperatures around 3c with 3 layers of non-heated gloves. Some degree of dexterity id important for me, of course. I would recommend you get a pair of heated glove liners. Glove liners work well for people who are concerned about dexterity because they’re much thinner than regular gloves. If you want even more warmth or water resistance you can just wear an extra pair of gloves over top of them. Here’s a list of some good heated glove liners.